UK Government "Must Consider Impact of Austerity on Housing Crisis"
Scottish National Party MP Dr Eilidh Whiteford has called on the UK government to consider the ongoing impact of its austerity agenda on housing. Speaking during an opposition day debate in the House of Commons today, Dr Whiteford said that UK government cuts have left landlords struggling to invest in new housing stock, and have impacted on the ability of devolved and local governments to meet housing need. “Although much of housing policy in Scotland is devolved to the Scottish Parliament, the financial framework in which it operates is determined at Westminster. Scotland has had a 25 per cent real terms cut to its Capital budget since 2010, and ongoing austerity will restrict the ability of future Governments to respond adequately to a growing housing crisis. “The SNP's commitment to housing is underlined by the fact that in spite of austerity cuts, the Scottish Government is on track to invest over £1.7 billion pounds to deliver 30,000 new affordable homes by next year – and we're already more than 90 per cent of the way there. That track-record compares favourably with other parts of the UK, and with previous administrations. “We need a thriving private rented sector that’s an attractive and affordable option for tenants. The cost of buying a house means home ownership has hit a 30 year low, and demand for rented accommodation in both the private and social sector has soared, often driving up rents to eye-watering levels. Banff & Buchan MP Eilidh Whiteford has condemned the Tory UK Government’s plans to privatise the remaining 30% stake in the Royal Mail. 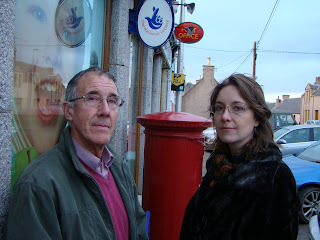 The local MP, who has long campaigned on Royal Mail issues, says the move further threatens the terms of the Universal Service Obligation – which safeguards postal services and deliveries in rural areas like Banff & Buchan. The SNP’s Dr Whiteford has questioned the legitimacy of the move by the Tories, as they made no reference to it in the run up to the election. “Over the years many people have contacted me on a wide range of Royal Mail issues. They have done that because they value the service and, in particular, they value the Universal Service that is vital to health of our rural communities. “Along with my SNP colleagues we resolutely opposed the privatisation of Royal Mail and we oppose the disposal of the remaining 30 percent stake in the company. The total sale of Royal Mail to the private sector is giving away the family jewels. “Last year the National Audit Office concluded the sale of Royal Mail was rushed at the expense of value for money, but now the Tories are just carrying on regardless. “The future of our Royal Mail services continues to be regularly raised with me in communities in Banff & Buchan. The implications of a privatised Royal Mail seeking to dilute or end the Universal Service would increase the cost of doing business in rural area, it could lead to centralised collection of mail and make life very difficult for those who rely on mail services in rural and remote areas. Banff & Buchan MP Eilidh Whiteford has praised Fraserburgh charity People First, following a constructive meeting on Friday to discuss the challenges faced by disabled people in the North-east. The charity, founded in 1993, represents the interests of disabled people in Fraserburgh. The group is run by and for disabled people, and operates a lively drop in centre in the town’s Cross Street. Dr Whiteford, who was recently announced as the SNP’s Westminster Spokesperson on Social Justice, met with staff and users at the group’s drop-in centre on Cross Street, to hear first hand how disabled people are being affected by the UK Government’s austerity programme. The Banff & Buchan MP also took the opportunity to hand over a donation of £50. “It is always a pleasure to see first-hand the good work People First do in Fraserburgh, and to find out more about the challenges faced by disabled people living in Banff and Buchan. Dr. Eilidh Whiteford MP has today toured Young’s Fraserburgh, which is now Young’s Seafood Limited’s Centre of Excellence for White Fish processing and packaging. Dr. Eilidh Whiteford, the MP for Banff & Buchan, saw the progress, investment, job creation and development underway at the site. Since announcing plans to make the Fraserburgh site the Centre of Excellence for White Fish in June 2014, Young’s has rebranded the site from Macrae to Young’s Fraserburgh, made a multi-million pound investment into the site as part of the expansion programme and appointed new senior managers to the team. The expansion programme means that the site now employs between 600 and 700 people, with more roles during busy seasons, in the local community. During her visit, Eilidh met the management, new members of the team who have benefitted from job creation and saw the new equipment installed at the site.